Immediately upon entering Unit 11C, you will know you are in Paradise - spectacular is the only word to describe the condo and the panoramic views. 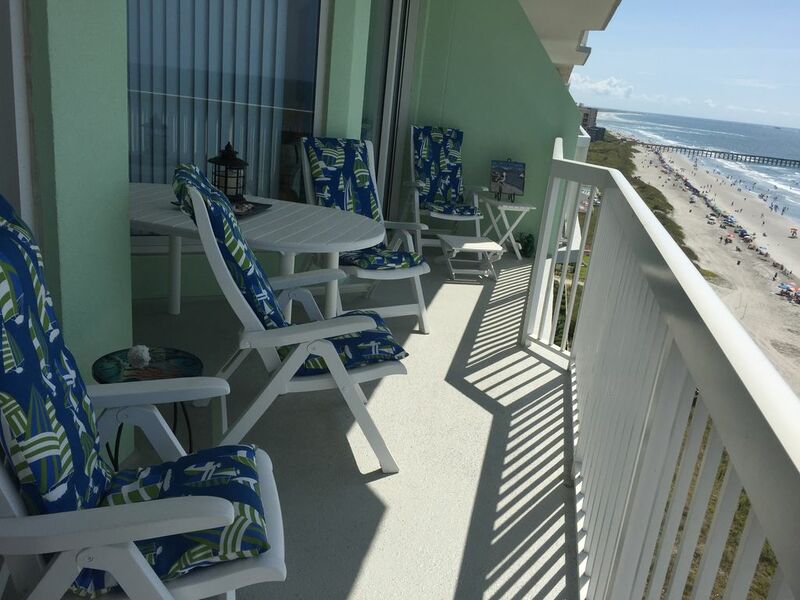 From the balcony, you'll see the vast, white, sandy beach, sparkling ocean, piers, and sun deck below with multiple pools and beach walkway. As a bonus, there are also views, out the front, that include the Cherry Grove Inlet, channel homes, and golf course beyond. Inside you’ll be amazed with the exquisite amenities, the nautical theme, tropical colors, and unique furnishings. A perfect, well-equipped kitchen awaits the chef in your crew with granite counter tops, new top-line stainless steel appliances including a slide-in range with glass cook-top and warming drawer, an Executive Chef cast iron sink and instant hot water dispenser. A gorgeous handcrafted Cypress-wood bar, with four bar stools, separates the kitchen and dining area which includes a glass-top table, six palm-tree chairs and a wine bar/cabinet. The living area is appointed in a maritime theme with bright, comfortable furnishings, lots of glass to bring the ocean and beach right inside and a custom-designed, hand-crafted Cypress-wood entertainment center complete with 50” HD flat screen TV including DVR, surround sound, Blu-ray player with CD and iPod docking and a Wii Game Console. On the balcony, you can have lunch, cocktails or just relax on the glider or lounge chairs while you enjoy the beautiful view of the beach below and feel the ocean breeze blowing across your face. Our condo accommodates a maximum of six people with its three bedrooms and three baths. The master bedroom has a king-size bed, 42 inch flat screen HDTV with Blu-ray player, and an additional large sliding door entrance to the 30 foot balcony. Your master bath includes a Jacuzzi tub, walk-in shower and a double sink vanity. The yellow bedroom has twin beds which can be converted to a king-size bed, 42 inch HDTV with DVD player, desk, a window with views of the channel, inlet and golf course beyond and an adjoining bath with a tub/shower combination. The green bedroom has the same marvelous view, queen size bed, and a 32 inch flat screen HDTV with DVD player. The adjoining bathroom has a tub/shower combination and also opens to the hallway. Paradise Pointe is landscaped with tall Palm trees and amenities that include both indoor and outdoor pools, a Lazy River, kiddy pool, and a wonderful pool deck where you can relax, bask in the sun and listen to the ocean just beyond. It’s located near the end of the island which is a great place to hunt for seashells and enjoy long walks on the wide beach. Just a few blocks away is the Cherry Grove Park and Boat Ramp which includes a boat launch, fishing pier, floating boat dock, picnic shelter, bird watching pavilion and parking for the Heritage Shores Nature Preserve. The Preserve extends into the Cherry Grove Marsh, is maintained in its native state and is accessible via a series of boardwalks and observation docks with signage throughout that describes the plants, animals, fishes and birds that can be seen in the park. Additionally, for business or pleasure, a secure internet connection is available with high speed wireless throughout the condo along with a printer/copier. We also have a beach storage closet that’s filled with toys, chairs, and beach essentials, all yours to enjoy. We’ve tried to ensure that your only disappointment will be having to leave at the end of your stay . . . but not to worry . . . we’re counting on you to come back soon and we’ll leave the lighthouse light burning for ya! It was a beautiful condo overlooking the ocean. Perfect for you and all your girlfriends! I booked this beachfront condo for a long weekend for myself and 4 of my girlfriends to celebrate our 40 birthdays! We are all hard-working career women and wanted a relaxing and quiet escape that included everything we needed so we could just sit back and relax and not worry about anything! We wanted to unplug and that is exactly what we did! Jean's condo is truly oceanfront paradise!!! There was PLENTY of room for 5 adult women in the condo. The layout was perfect and there was plenty of seating in the living room for all of us to sit around and gab! There were plenty of towels, blankets, pillows, etc. The kitchen was FULLY stocked with any thing you would EVER need! The living room area had books, movies, games, magazines for all ages and the cutest seagull figurines (that we may have given nicknames too!). Most important to all of us was that the condo was extremely clean and well-maintained. Our expectations for cleanliness were exceeded! You could tell that a lot of care was taken to make sure each room and bathroom was cleaned thoroughly. Rose, the caretaker, gave us a tour of the condo when we arrived. ROSE WAS AWESOME!! Rose is so fun and full of energy. She got our weekend started off on the right foot! Rose also showed us the magical outdoor closest on the front patio area. This magical closest included everything you would need for a day at the beach!! Chairs, umbrellas, beach cart, sand toys, coolers, etc. Jean and Rose exceeded our expectations when it came to customer service! The condo was PERFECT! I would highly recommend this condo! We hope that we can all work out our crazy work schedules again this summer so we can book this condo again!!! Don't wait another second, contact Jean now and book your oceanfront paradise! We are so glad you ladies enjoyed your special beach time! It was our pleasure to have you and we look forward to your return! Thanks so much for taking the time to write a review - see you in 2019!! This was our second year staying at Jean's condo, and just like last year, everything was perfect and it felt like coming home! We have been coming to North Myrtle Beach for 12 years now, and it holds a very special place in our hearts. Our family looks forward to this vacation every year, and this condo is the cleanest and most beautiful one we've ever stayed at! Almost every year we came on vacation, we had to clean the entire first day, but not at Jean's! Everything is immaculately clean, that you do not have to waste time cleaning at all. The condo is stocked with everything you could possibly need on your vacation including first aid kits, kitchen appliances, cotton bed-sheets, bath and beach towels, comfortable beach chairs, and so much more. It is impossible to write out everything that this condo provides. Everywhere you look, you feel like you are on vacation, because it is so beautifully decorated. Also, the views are incredible! We would watch the sunrises every morning from the bench on the balcony and sunsets on the chairs that are by the entrance of the condo. It is honestly the most perfect place. We are so grateful to the owner Jean and manager Rose for everything. We have never met such kind and generous people, who make us feel like family. We enjoyed our vacation very much and God-willing we will definitely be back! If you are looking for a great vacation, without a doubt, this is the place for you! My family and I thoroughly enjoyed this beautiful and clean condo! It was a wonderful vacation! It was so nice to be able to use the beach chairs and umbrella too! Can’t wait to stay again! We have been vacationing in Cherry Grove for approximately ten years and this condo was by far, the absolute best ever! We began by messaging Jean, the owner. She replied quickly and answered all of our questions. Upon arriving at the condo, we were greeted by Rose. She was entertaining and informative. This condo was without a doubt, the cleanest place we have ever stayed. I usually clean the first day we are at the beach, however, this stay I was able to just change and head right to the beach with my family. Everything you can think of is provided here. From the spices in the kitchen to the chairs, toys and beach towels. We never wanted for anything. Thank you for providing us with an incredibly relaxing family vacation. We will definitely stay here again!!! Tax of 12% must be added to all above rates; departure cleaning is included for stays of 7 or more nights; add $100 for cleaning if less than 7 nights. VRBO/Home Away also charges a Service Fee which goes directly to them, not to the owner of this property.